Kayaks are mainly single person craft with a closed cockpit but we use sit on top Kayaks both doubles and single for those who need to build their confidence first. 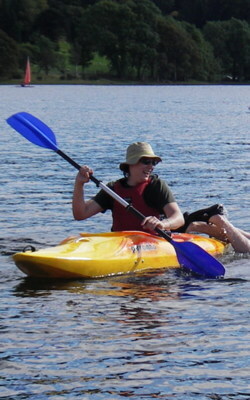 The sport of kayaking is often referred to as canoeing. 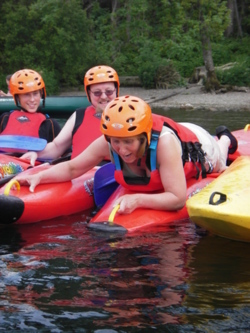 As a group activity you can have great fun in a kayak, enjoying a number of wet games or learning the numerous paddle strokes involved in the sport of kayaking. As you will see from some of our images, kayaking is an activity that can be enjoyed by ages from seven to seventy and above. From placid waterways to raging rivers we can give you all the help you need to get started or help you to improve your kayaking technique. The North West of England has a wide selection of kayaking venues, whether on canals, lakes, rivers or on the sea. For Lakes and River paddling it's hard to beat the English Lake District with it many rivers and Lakes and stunning views. A kayak or canoe is a great way to see some of our industrial history. Canals are the motorways of the past, coal, cotton and steel were just a few products transported along the many canals in the North West around Preston, Greater Manchester and Lancashire. 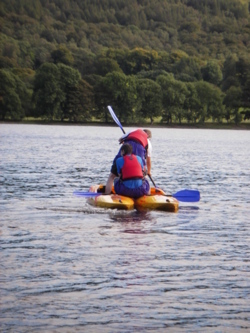 To view some of our kayaking pictures please click here kayaking images. are happy to help and advise you on the best places to buy kayaks and kayaking equipment.